Abstract. Resolving and understanding the drivers of variability of CO2 in the Southern Ocean and its potential climate feedback is one of the major scientific challenges of the ocean-climate community. 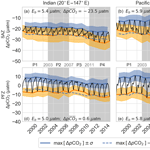 Here we use a regional approach on empirical estimates of pCO2 to understand the role that seasonal variability has in long-term CO2 changes in the Southern Ocean. Machine learning has become the preferred empirical modelling tool to interpolate time- and location-restricted ship measurements of pCO2. In this study we use an ensemble of three machine-learning products: support vector regression (SVR) and random forest regression (RFR) from Gregor et al. (2017), and the self-organising-map feed-forward neural network (SOM-FFN) method from Landschützer et al. (2016). 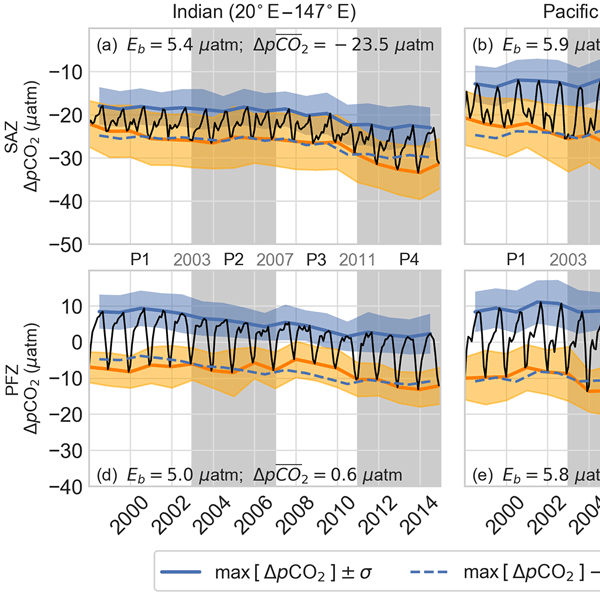 The interpolated estimates of ΔpCO2 are separated into nine regions in the Southern Ocean defined by basin (Indian, Pacific, and Atlantic) and biomes (as defined by Fay and McKinley, 2014a). The regional approach shows that, while there is good agreement in the overall trend of the products, there are periods and regions where the confidence in estimated ΔpCO2 is low due to disagreement between the products. The regional breakdown of the data highlighted the seasonal decoupling of the modes for summer and winter interannual variability. Winter interannual variability had a longer mode of variability compared to summer, which varied on a 4–6-year timescale. We separate the analysis of the ΔpCO2 and its drivers into summer and winter. We find that understanding the variability of ΔpCO2 and its drivers on shorter timescales is critical to resolving the long-term variability of ΔpCO2. Results show that ΔpCO2 is rarely driven by thermodynamics during winter, but rather by mixing and stratification due to the stronger correlation of ΔpCO2 variability with mixed layer depth. Summer pCO2 variability is consistent with chlorophyll a variability, where higher concentrations of chlorophyll a correspond with lower pCO2 concentrations. In regions of low chlorophyll a concentrations, wind stress and sea surface temperature emerged as stronger drivers of ΔpCO2. In summary we propose that sub-decadal variability is explained by summer drivers, while winter variability contributes to the long-term changes associated with the SAM. This approach is a useful framework to assess the drivers of ΔpCO2 but would greatly benefit from improved estimates of ΔpCO2 and a longer time series. How to cite: Gregor, L., Kok, S., and Monteiro, P. M. S.: Interannual drivers of the seasonal cycle of CO2 in the Southern Ocean, Biogeosciences, 15, 2361-2378, https://doi.org/10.5194/bg-15-2361-2018, 2018.